One year ago, Dr. Cara VanWormer-Hartman opened the new home of Therapeutic Health, her chiropractic and internal medicine clinic off Ogden Avenue in the former home of Tommy R’s Catering kitchen. The storage freezers and industrial cooktops have been replaced with bright but calming treatment rooms and public spaces with lots of natural light. In a way, the new medical office reflects Dr. Cara’s personality. She, too, is bright and welcoming, and she has a way of putting you at ease. Her patients—most of whom are visiting her for chiropractic care or clinical nutrition—call her Dr. Cara. After a year in practice in Hinsdale, you can tell she’s really settling in. “Our goal was to create a healing center,” she says. 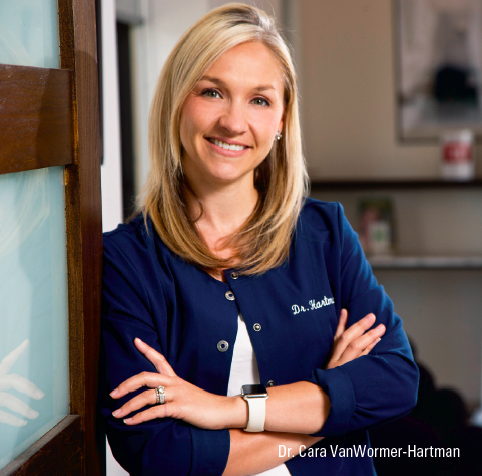 Dr. Cara’s background is in chiropractic health—she’s board-certified through the American Council of Chiropractic Internists—but her services include a spate of Eastern medicine practices aimed to help heal the body from the inside out. She’s been practicing for eight years, and she says she always knew she wanted to go into the medical field—just not exactly where. “I knew I wanted to practice an area of medicine I could live by,” she says, which led her to chiropractic medicine and internal health. Those two practices work hand in hand, Dr. Cara says. “Everything stems from your intestinal tract,” she adds, and usually when she’s treating a patient for disc herniations and other chiropractic issues she’s simultaneously treating internal health problems, whether it’s G.I. issues, allergies, or weight problems. So, just how does she help them get there? One of the newest options available at Therapeutic Health is called NET, which stands for the Neuro Emotional Technique. It uses a muscle test to find the triggers for stressors in our bodies that cause anxiety, depression, and other issues. “We are unconsciously putting stress in different areas of the body,” Dr. Cara says. It’s not just our heads that are affected by certain emotions; it’s other areas of the body too. Dr. Cara has integrated NET into her overall treatment plans for many patients because she says healing the body has as much of an emotional component as it does a structural component. Dr. Cara clearly has a real desire to bring the latest technologies and treatments like NET to her patients. “I want to be an expert,” she says. “I want to be the best so I can get my patients better faster.” She regularly travels to conferences and other events to learn the latest techniques and meet with colleagues in her field to determine which evidence-based techniques are producing the best results.